So I was really pleased to finally spot a piece that ticks ALL of the above boxes (low slung waists, embellished bits, gold, black and flaps with a little bit of thrill involved). Gorgeous - and an absolute steal for £75.00. 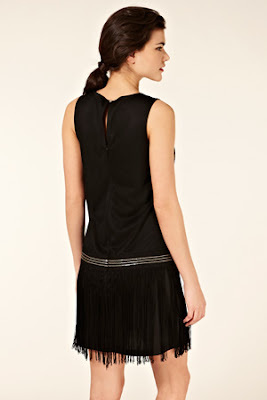 Perfect for a prom or a sophisticated party - plus the pattern on the body is uber flattering as it draws the eye in! A friend of mine is looking for an outfit for a birthday party drinks - just popped her over the link for this, it's perfect! Just partner up with some red lipstick and simple heels = look done. Gorgeous dresses! Modern yet very 20s! I like the gold accents! Ooooh it's gorgeous! So similar! You're quite right, they are beautiful. I love the bottom one the most! 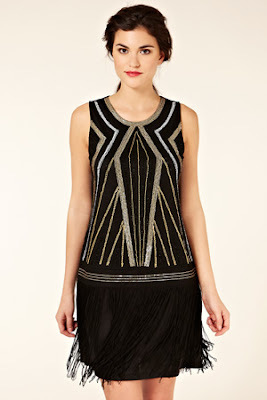 I'm not a huge fan of the 1920s styles since for me a dropped waist is pretty shapeless since I'm a bit up and down, but I do love seeing the metallics that are in stores right now. I miss Oasis, too.